This photograph has been scaled down; full resolution photograph is available here (991 by 968 pixels). CRIMES AGAINST HUMANITY: Located near Bergan and Belsen villages in what was then Prussian Hannover, Germany the camp held over 60,000 it didn't have any gas chambers, but over 30,000 died there, even after VE Day in spit of medical efforts thousands died due to disease, infections and starvation. THOUSANDS LAY UNBURIED: In March 1945 alone, 18,000 died and the number of deaths from January to April 1945 were 35,000 within five days of liberation 14,000 more people died. Bergan-Belsen was liberated by the British 11th Armored Div.on April 15, 1945 when they arrived over 13,000 corpses lay around the camp unburied. 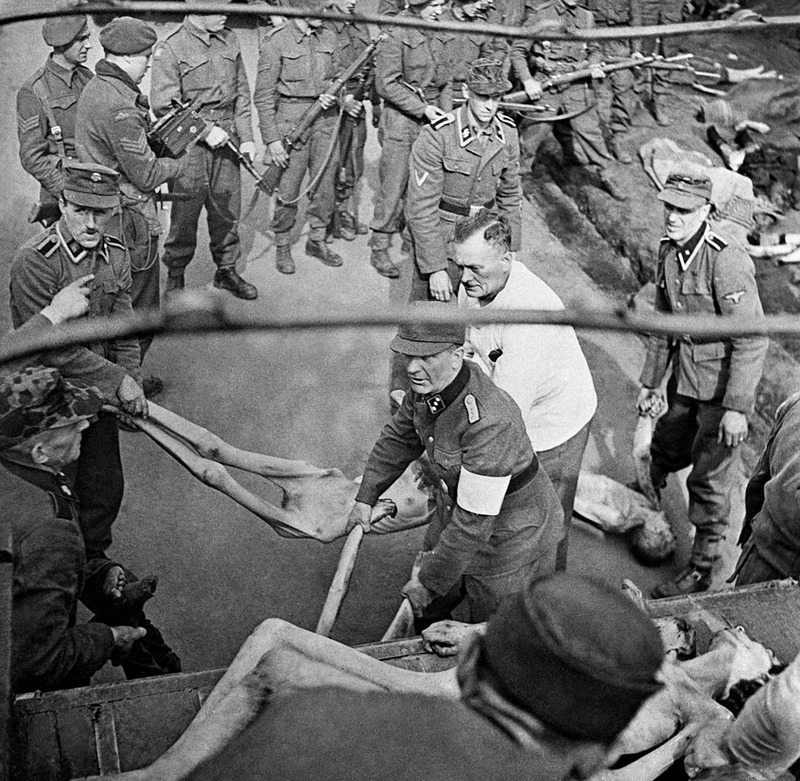 THE AFTERMATH: Former SS Guards were tried by the British dozens of personnel were found guilty of murder and crimes against humanity most were hanged. UNIFORMS OF THE SS GUARDS: SS Guards have been issued the late pattern field-gray uniform without pleats on the pockets. The SS man with the white armband was used as a sign of surrender, his rank is 2nd Lieutenant, the other guard with chevron on right sleeve is a Lance-Corporal, w/SS runes on his right collar and rank on the left the others are Corporals and (PFC) Private First Class the Corporals collar lace is silver, but in a black & white photo looks white in color, they are wearing the M 1943 field cap w/deaths head insignia the guards are wearing ankle-boots w/canvas gaiters. The man in the white jacket, is unidentified as no rank is showing. The British are armed with Lee-Enfield No.4 rifles one Sergeant is carrying what looks like a movie camera, the other Sergeant is armed with a No.4 rifle like the other troops, and one carries a Sten 9mm submachine gun.